From top to bottom: Our Liberty London floral print will brighten up any outfit. Next we have our soft grey and cream dreamy print. 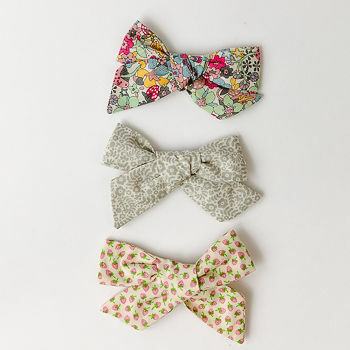 Last is our strawberries and cream - cuteness in a hair bow. Our bow packs are delivered in a beautiful pink box, perfect for a princess. Free delivery. Gift message options are available at checkout.